In his endearingly unique and always charismatic way, Jonathan Hennessy Sceats has kicked off 2019 with the launch of two new revolutionary collections for Jono Hennessy and Carter Bond. Continuing his passion for innovation, design and craftsmanship, the collections incorporate a series of new constructions, materials and colour combinations that are sure to excite, and continue Hennessy Sceats’ pioneering reputation for which he is internationally renowned. 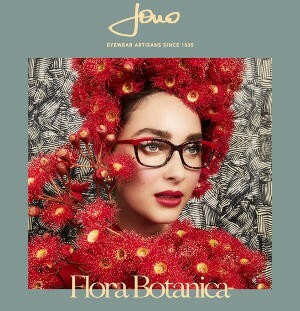 Crafted from new bespoke acetates that draw inspiration from Australian flowers and landscapes, the Flora Botanica collection stands out with its stylistic blend of sophisticated elegance and vibrant details. Characterised by outstanding juxtapositions and tonal pairings the collection consists of four new styles that reinterpret classic rectangular and cat eye silhouettes. The refined acetate fronts feature feminine lines enhanced by unique laminations of colour, which have been creatively designed to offer a striking look. Utilising a uniquely Australian palette of colour combinations and textures, the collection varies from classic black and iridescent shades of marble, to delicate nuances of flowering gum red, cobalt blue and ocean green. Inspired by the rugged Australian countryside, the Carter Bond Wanderlust collection has been masterfully created by Jonathan Hennessy Sceats to inspire the modern man with modern frames reminiscent of a vintage era. Focusing on masculine textures and details, new metal silhouettes have been crafted from stainless steel using triple-channel rim and end-piece detailing. The collection also features the introduction of two new distinguished titanium frames, created with a sharp aesthetic and finished in two-tone diamond blast textures. A desire to reconnect with nature inspires the colour palette for the season, with the introduction of real wood laminated onto carbon fibre, pared back with acetate tones of navy, grey and tortoiseshell.